In our first workshop, Chris Skye visited The Kitchen Collective and taught us how to make ‘Indian Tacos’. We made Bison Chili, and our own Fry Bread, then topped it off with lettuce, tomatoes, cheddar cheese, and sour cream. Yum! In week two, Mark Sault visited The Kitchen Collective and showed us all the steps involved in ‘lying’ corn to preserve it. We then made a traditional Corn Soup with Fry Bread & Ham, and Labrador Tea. In our third workshop, Josh Dockstator visited and showed us how to prepare Bison Cheeseburgers with Wild Boar Bacon. Ted Syrette came by The Kitchen Collective to share his version of venison stew, a hearty dish filled with venison meat and fresh vegetables. Connor General, a recent culinary school graduate, visited the kitchen this week and showed us how to use traditional ingredients like wild rice, squash and cranberries to make a modern dish inspired by Italian risotto. We also grilled two different types of sausages on the charbroiler: Wild Boar with Cranberries, and Elk Honey Lager Apple sausage. Wild rice is not rice at all! It’s a type of aquatic grass and has been harvested by Indigenous people in North America for about 12,000 years. 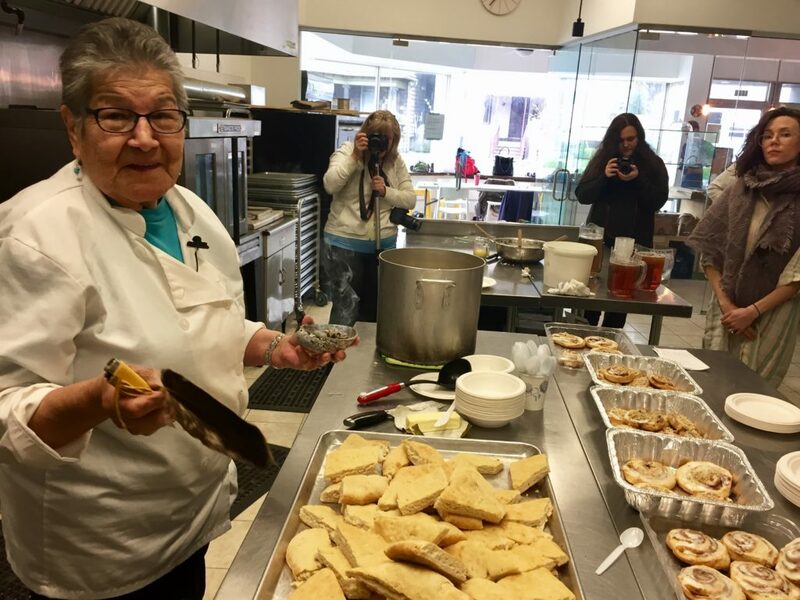 An enthusiastic educator and entertainer, Chef David Wolfman is an internationally recognized expert in wild game and traditional Aboriginal cuisine. A member of the Xaxli’p First Nation in BC, David Wolfman is a classically trained Chef, Culinary Arts Professor at George Brown College of Applied Arts and Technology in Toronto. In addition to teaching, he is Executive Producer and Host of the popular Cooking with the Wolfman™ television program. This show features David’s signature “Indigenous Fusion: Traditional Foods with a Modern Twist” and is aired on APTN (the Aboriginal People’s Television Network) in Canada and FNX (First Nations Experience) in the US. 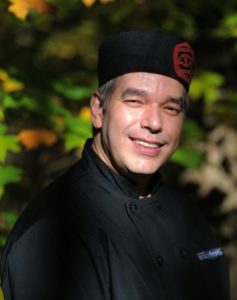 As a culinary consultant and trainer, David designs special event menus and leads workshops in goal setting, healthy eating and healthy weights, and indigenous culinary and cultural tourism. Chef Wolfman has worked as a chef and hospitality staff trainer for hotel resorts in northern Ontario, New Brunswick and Jamaica. He is a popular, motivational speaker at First Nations youth conferences, business association gatherings, and postsecondary education career events. Together with his wife and business partner, Marlene Finn, David sells a line of culinary knives, guides commercial kitchen renovations, conducts restaurant makeovers, and leads cooking and diabetic cooking demonstrations, cooking competitions, and hands-on team cook-offs at national exhibitions, international sports events, fundraising dinners, health expos, and Aboriginal celebrations across North America. David is the recipient of numerous educational and industry awards including seven Gold Awards in Culinary Olympics, an Excellence Award from the National Institute for Staff and Organizational Development, an Outstanding Achievement Award from the Canadian Council for Aboriginal Business, and a 1st Place National Healthy Menu Catering Award from Evian. He was nominated by George Brown College for the Premier’s Award in 2016. Chef Wolfman exudes unbridled passion for cooking and sharing his knowledge of Aboriginal culture and the culinary profession. David and Marlene are currently working on their first cook book which is expected to be released in the fall of 2017.